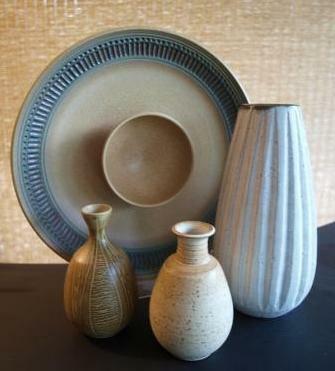 Welcome to a new page on studioceramicscanada.com on the Hansen-Ross Pottery in Fort Qu’ Appelle, Saskatchewan. David Ross and Folmer Hansen maintained a joint studio focusing on Scandinavian and Leach-inspired art in the middle of the Canadian prairies. Much of the material is based on an interview I had with Folmer Hansen many years ago. Stay tuned. More pages are in the works on artists such as Paula Murray, Ann Mortimer, Susan Collett, Enid Legros-Wise, Connie Pike, Les Manning, Stan and Jean Clarke and many others. Anyone who has memories or images of these artists they would be willing to share please contact me. This entry was posted in Consolidation, Expansion, New Artist Page, Pottery, Saskatchewan, Signature/Mark/Chop and tagged Hansen- Ross, Saskatchewan on October 30, 2013 by Barry Morrison. Congrats Barry on great Hansen-Ross article – I enjoyed reading about all the connections as they travelled about, particularly Hansen being the hidden Potter at the Deichmanns. I have a lovely little Hansen lamp. Tyler Peace sure has an impressive collection! Many thanks, Debra. And yes, I would be interested in the essay by the Emily Carr student. Thanks for the heads up.